It took a full day of rain (and in NZ a ‘full day of rain’ means 12+ hours of the wet stuff) before the heavens finally dried up on Monday morning, leaving our soggy tent in the middle of one big puddle. The evening before was marked by the very odd sensation of being on a water bed. Every twist and turn on our sleeping mats sent a squirt of water rushing off to another corner of the ground underneath us. But the tent inside stayed perfectly dry. It’s been our home now for 362 nights. It’s suffering quite a bit of UV damage, general wear and tear and of course those holes the ants chewed back in Thailand and it still held up to a rainstorm. Amazing. So, after all that rain, when we awoke to deeply grey and cloudy skies we didn’t see the darkness. Just a sky with nothing falling from it and we were off. Out the driveway of the campground we went, past the road to Fox Glacier (closed because of all the rain) and onto the nicely rolling road towards Haast. Just a few minutes into our day, another cyclist approached. “Good morning!” we shouted at him, waving and ringing our bells. 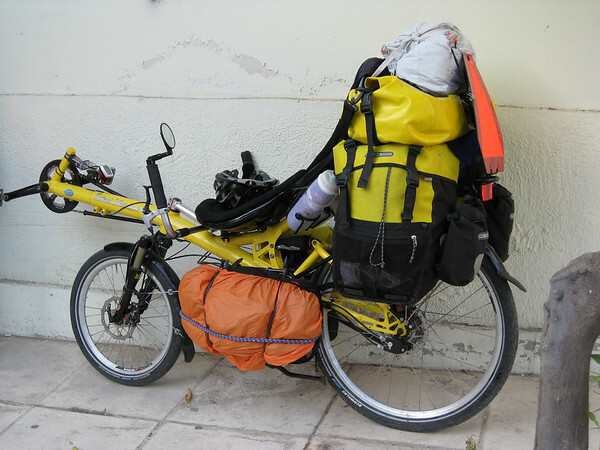 “You’ve got too much stuff,” he replied, putting his head down and pedalling harder as if to show us that with his mere 2 bags to our 11, he really could go that much faster. “You haven’t been travelling long enough,” we yelled back but he was probably out of earshot by then. We mulled over his words. Stuff. Well, yes, we do have rather a lot of it. One of these days we are going to take a picture (as suggested by Grace of Bikefish Adelaide) of us with all our stuff out of our bags and set in neat piles around us. Maybe then we’ll really know how we manage to fill all our bags. Every once in a while we go through a phase where Friedel decides we have too much stuff and tries to weed it out while Andrew reminds her just how much we actually need those things or if we don’t now then we will down the road. And that’s the thing about long trips. You carry stuff around, maybe not using it for 6 months, because you know, you just know, that somewhere, in a country yet to be visited, you’ll find yourself suddenly in desperate need of that thing and if you throw it out now you won’t have it and you certainly won’t buy it again because you’re just too cheap from travelling so long. And then there are the things you just enjoy having. Things like the books that you hoard when you find a good one because who knows when you’ll find another good one and who really wants to be forced to read Harlequin Romances, the type of book most often found in campgrounds? And then there’s our little container of salt, which is about as big as a small peanut butter jar and which Grace pointed out we wouldn’t likely use up before we reached home but will we throw it out? Heck no. It’s about the same weight as that rock that Friedel picked up on a beach a few days back. They balance each other out. There’s no denying it. We have a lot of stuff. About 92kg of stuff including bikes and bags but not counting food and water and whatever we carried on the airplane when we flew from Singapore to Australia. But we would just like to point out that while we were cycling up the fantastically beautiful but also super-steep roads that go up the Haast Pass, we cycled the whole way. And when we met a group of touring cyclists on the road, all travelling with a van that carries their bags, we beat most of them up the hills leading up to Wanaka! So maybe we can thank all that stuff for giving us legs of steel. It was with this group of cyclists that we met Buzz, the tour leader. What was his story? 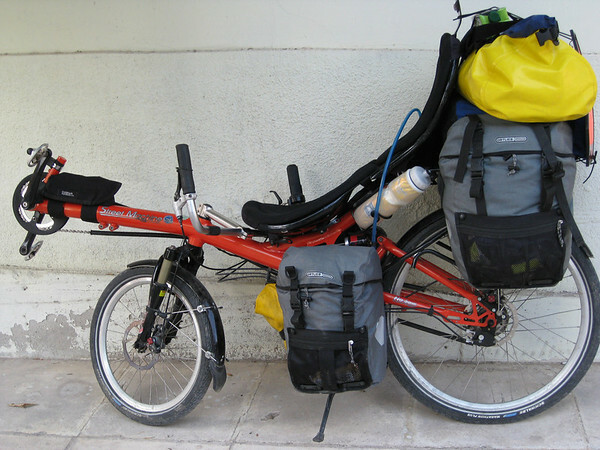 With a bit of prodding we learned he’d cycled nearly 100,000km over 6 years in the 90s. We talked for a while as if we’d known each other forever and then he gave us some advice. Stop now, he said, or at least think about stopping soon. He’d gone on too long. He couldn’t settle down. He was forever nomadic. His words got us thinking again. We know we’ll have to try and settle down soon, at least a little bit, or we’ll probably never do it. And maybe this sense of being nomads is why we hang on to all our stuff. It’s all we have! When your whole life can be condensed into a few bags and you carry your food and your home and your clothes on your back, everything becomes precious. Too much stuff it might be. But it’s our stuff and we love it. Great post! Enjoy NZ and the rest of your time on the road. Glad to see you’re having fun in NZ, and seeing some spectacular terrain despite the rain. This is a very topical post for us! We’re in Singapore now, and trying to decide what we’re going to send back to Canada. There’s a bunch of stuff we won’t need until we start riding across from Vancouver (woolies, heavy raingear, and lots of other bits and pieces). I’m usually with Friedel on the too-much/not-enough stuff argument, and Becky is on Andrew’s side. Always difficult to decide when it comes down to cases. We certainly won’t get down to two bags each, no matter what we do! Thank you for the beautiful photos in your New zeland gallery. Enjoy your stay in NZ. Turkish trip will be written up in a few days – the bit you took the bus through; twas heaven and hell! Ah, you’ve seen the photos before we’ve written a post! The 40,000km is just on Andrew’s bike (it includes some commuting to work and other stuff before we left). The trip isn’t quite there yet…. glad Turkey was nice. I will be interested to see what we missed on the bus. We did it at night but it seemed like the road would have been a stunner, if it wasn’t packed with cars.